When I first moved to the Pacific Northwest (the Oregon/Washington area of America, for those of you unsure), I was blown away by the terrain. It’s beauty countryside, for sure, but the skyline is always scarred by very, very dramatic mountains – which are actually (not quite) extinct volcanoes. They’re so huge they appear quite close, even though you can spot them over a 2 hours drive away. They’re a real feature of visiting here, and if you can, they’re worth visiting. 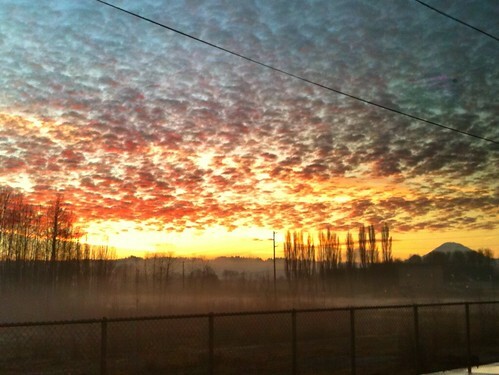 This is a shot I captured from sunrise from a train station in south Seattle. That big hill on the side? It’s Mount St Helens – and it’s probably a 2.5-3 hour drive away. Often, in Seattle, you can’t see it due to the clouds. 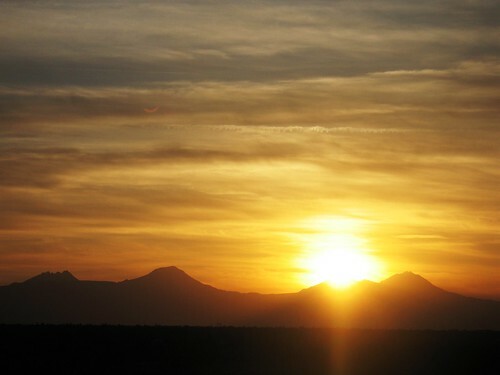 Then, on a sunny day, it appears, and you’re reminded at how powerful volcanoes can be. Mt St Helens erupted in the 1980s, and one unique after-fact is that now you can explore what are called lava tubes – they’re caves that were made by flowing lava as it cooled. They look identical to real caves, except that the floor and ceilings are quite rough (as opposed to caves that were carved by flowing water, much smoother). 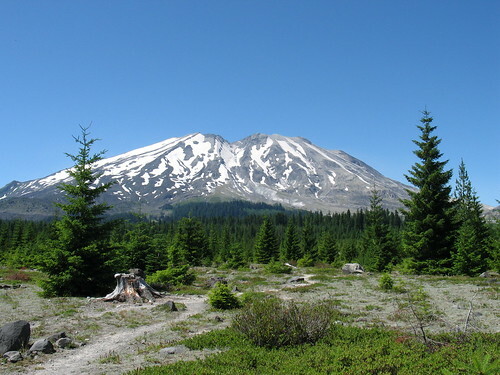 Mt St Helens is great for a live case study of volcanoes, and some terrific hikes too. 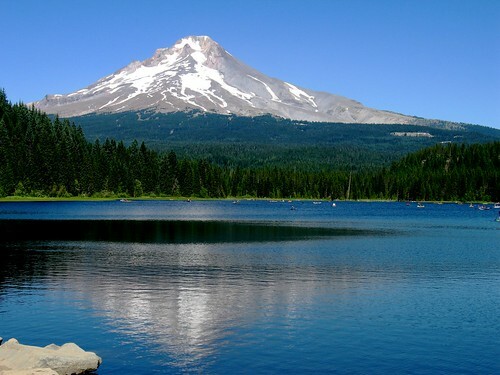 Mt Hood is home to a popular ski-resort, as well as the famous Timberline Lodge, where many exterior shots of the hotel featured in The Shining were filmed. 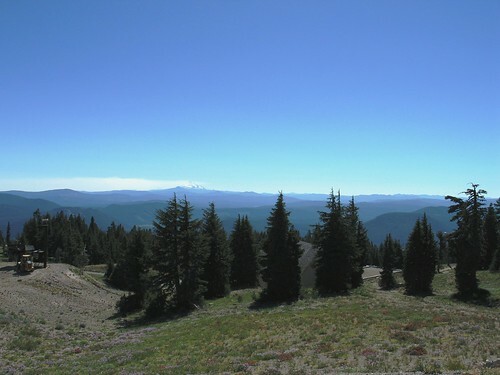 Mt Hood also has lots of hikes and other activities great for families. If you want to spend more time here, there are also lots of lodges and camping options. When driving or hiking in the mountains, please remember to follow common sense safety procedures, because the weather can easily change on you at these altitudes. It is true that the region is overdue for a major earthquake, and there are many volcanic areas that are still technically active. You shouldn’t have anything to worry about with regards to that (there is usually plenty of warning, at least on the volcanic explosion front), but many hikers have lost their lives being ill prepared for their visit. Always, always make sure someone knows if you’re heading up the mountains, and let them know when you will check back in – this is no place you want to be left behind, and mobile phones typically do not work once you get out of populated areas (on Mt St Helens, you can be without service the entire time, until you get back on the expressway!). Always bring water and snacks with you, as there are little if no amenities of that sort available. Have fun – the views are worth it. Photos by Chris M Morris & Andy Hayes.